Even though it is freezing cold outside, I can be content to know that spring is coming. How do I know this? We are past the shortest day of winter, and that means the days will be longer. Which means that the sun will be out more. Which means one day I can be warm again. So last spring/summer we had the back door open for fresh air, a lot. A mouse came in, so we got traps and caught it in just a couple days. This fall another mouse dared to enter the house. We set the traps again, and it was caught with-in the hour of setting. We had one still set along the wall, just waiting in hopes that we would not catch another. We went out of town for a week, and the trap was empty. The temperatures dropped, a mouse came in for a snack. It died. 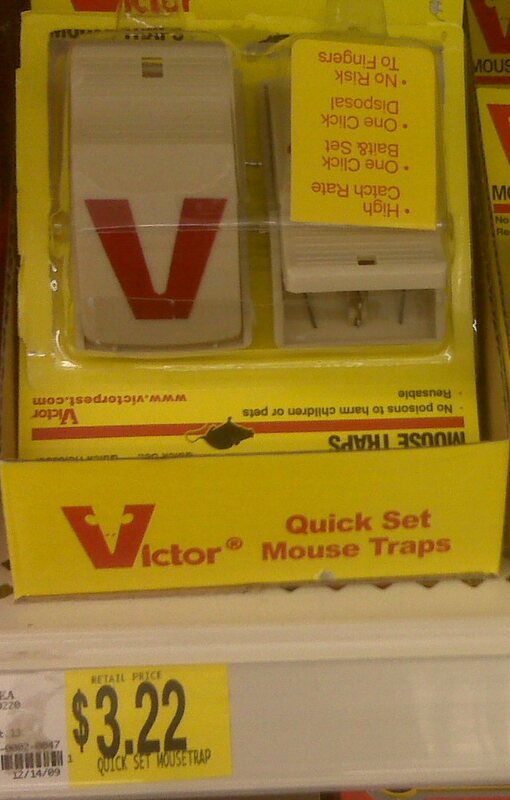 We went to pick up more traps (because even though it says reusable, let’s be honest here, I am not un-clipping the mouse and using that nasty thing again!) just in case we need them. The temperature outside keeps dropping, and I don’t want to be outside! It is the original price again. It makes me so stinking mad!!!!! We figure that because the outside temperatures dropped, many people were having trouble with the mice coming in, and the store (or rather the people who run it) decided that they might as well make extra money off the people who already have enough problems in their lives. And now that the traps are in less of a demand, the price has dropped back to the original rate. Now, if I can just think of how to make this work to my advantage…. Any ideas? Problem: I am cold. All of the time. I can not warm up. I sit in a room that is 88 degrees, and I need to put on a sweater. And a stocking cap. And gloves. And wool socks. And house slippers. Maybe it wil result in comfort. Not always, especially if all those things limit my mobility. At this moment the temperature is -9 with a wind chill of -19. I hate strongly detest this time of year. The only redeeming quality is that when blowing bubbles outside, they freeze. That is the ONLY redeeming quality. Does anyone have a house they would like to donate to us that is in a tropical region, or at the very least that never has temperatures that drop below 74 degrees farenheight? Posted on January 2, 2010 January 4, 2010 Author MarciaCategories Health, Random Babblings2 Comments on What can be the issue? We had to run to the store for some items, and while we were waiting to check out the line got really long. I am talking there were 11 carts/baskets in line, counting the person at the check out. That person was splitting the order on 3 tickets. WIC, foodstamps, and check. I have no problem with the programs, they are there for people who need them, I only mention them so you know how long it took, because there is paperwork involved. There was only one cash register open. Here is the point of this post. As the lady is making her purchase, the kid with her was looking at the “impulse buy” items. No big deal, I do it too. That kid was probably about 15 years old. The item he seemed to enjoy most was a laser pointer. He would look around to see if anyone was watching, cover the pointer so people “couldn’t see what it was” and hold it up to his eye and push the button. He did this a few times and then switched eyes. Each time he grimaced in pain, then continued. He ended up walking out of the store holding his eye in pain. Do people not realize that a laser can be very bad for the eyes? It even has warnings written on the product and the packaging. This is not what I first typed! So I had this good post about my root canal yesterday, but the internet said “no” so this is what you get. Yesterday I had a root canal performed. I have curved roots on that tooth, so I had the privilage of going to a specialist. Meaning it cost more money. But it is nice to have it done. He took the pain out of my tooth, and he was not hard on the eyes either. Can I say that? I am married, but I think he is too. Any how, I am on my way to a happier mouth (read: healthier). In the next couple weeks I will get a crown on that tooth, then I can tell people that I have a “royal” mouth! In seriousness though, it was not that bad. I had one done in Chile, and had no problems with it, though I think I must have blocked out some of the recovery experiences of it. This time I want to remember. It burns a LOT when the anesthisia wears off. It is a really odd feeling when half of your ear goes numb. This morning I felt what they were talking about with the whole “you will hurt for a while,” my jaw aches from being held open for an hour (half hour less than was expected! ), it aches more on the left than the right, the proceedure was on the left side. My head and neck ache too. Other than that, I feel pretty good. Posted on October 14, 2009 October 15, 2009 Author MarciaCategories Health, Money, Travel1 Comment on This is not what I first typed!